Williamsburg Christian Academy’s faculty and staff are a dedicated, innovative team of professionals that love kids and desire to make a positive impact for the sake of Jesus. Together as a team, the WCA faculty and staff partner with parents to help all students reach their full potential. Teachers are trained in the latest techniques through a vibrant faculty development program as a way to create exciting, dynamic, interactive learning communities where minds are stretched and challenged. Faculty serve as mentors, role models, club sponsors, and coaches. Alumni often comment how WCA teachers have impacted their lives far beyond the classrooms, even years after they leave campus. Beth Fletcher is serving as the Middle and Upper School Principal and oversees the Enrichment program. She grew up with her parents outside of Washington D.C., in Potomac, Maryland. Beth graduated from American University in 1989 with a B.A. in Psychology and earned her Masters of Social Work specializing in Disabilities in 1991 from Gallaudet University, also in Washington D.C. As Gallaudet is the premiere university in the world for deaf people, all of the classes are taught in American Sign Language and provided a truly unique opportunity for Beth to experience this very special culture and language. With this extensive knowledge, Beth also contributes teaching one class of American Sign Language. Prior to joining WCA leadership in 2010 as Head of Middle School, Beth was an Odyssey of the Mind coach, middle school math and science teacher and high school ASL teacher. She recently had the privilege of teaching AP Psychology and loved it! Beth and her husband, Mark, moved to Williamsburg in 2003 and joined the WCA family when they enrolled their children in the fifth and third grades. Their son, Ryan, and daughter, Kelly, were both graduated from WCA and are currently attending Virginia Tech (Computer Science Engineering) and James Madison University (Nursing), respectively. In her free time, Beth enjoys reading and spending time with her family and friends. The Fletchers attend Williamsburg Community Chapel. Linda Guntharp joined last fall to teach K-8 Art and Drama, and shifts upstairs this year to handle Middle School and Upper School Art. She holds a BFA from the University of the Arts, AAS Commercial and Computer Arts from TNCC, MBA from New York Institute of Technology and most recently an Interior Design degree from The Art Institute of Pittsburgh. Linda has worked professionally in the visual and performing arts for more than 25 years. Her teaching experiences include private lessons, studio workshops, and programs in both public and private schools. Linda’s most recent formal teaching experience was with Hampton Christian Academy where she taught 2nd through 12th-grade art and drama. Linda’s largest professional commercial accomplishment was completing over 20 murals as the lead artist on Busch Gardens ride “Escape from Pompeii”. Linda has been a volunteer and has served on the boards of York County School of the Arts and Eastern Virginia School for the Performing Arts for numerous years. She is a member of Tikvat Israel Messianic Congregation where she has previously served as drama director. Chelsea Meisinger is our Director of Fine Arts, and instructs our strings ensemble as well as leading or Praise Band/Tech Team. Chelsea is a native of the Hampton Roads area, having grown up in Newport News, VA. She attended Woodside High School where she participated in the orchestra and studied music theory. During her time there she performed at the Boston Pops Theatre and became Concertmaster of the orchestra. Chelsea graduated from The College of William & Mary where she completed her degrees in French & Francophone Studies and Elementary Education, with a focus in Teaching English as a Second Language. Chelsea began teaching in 2015 when she came to Williamsburg Christian Academy, after spending two years of practicum service at James River Elementary School in Williamsburg, VA. Chelsea enjoys singing, songwriting, playing instruments, leading worship, reading, and watching movies. She moved to Williamsburg in 2012 when she married her husband, David and together they have two dogs, Maggie and Izzy. They attend and volunteer at Waters Edge Church regularly, where Chelsea also leads worship periodically. Susan Rodenberg teaches middle school English, History and Bible. She graduated from James Madison University with a degree in English and with minors in political science and music. She is currently working towards a Masters of Education in Curriculum and Instruction at Regent University. Susan is a state licensed teacher who has been teaching middle school English for the last few years at Berkeley Middle School. Her daughter, Emma, is a WCA alumnus and her son, Peter, and daughters Allie and Lizzy are current students. Susan is a published author and is excited to enhance student appreciation of God's Word! Kristie Van Housen teaches Middle School is our 6th grade Bible Teacher,and is also the Middle School Director. Kristie grew up in Williamsburg and received her B.S. in Communication Sciences and Disorders from James Madison University. This is her third year teaching at WCA. Some of her hobbies include going to the beach, cooking, and spending time with friends and family. She attends church services at Williamsburg Community Chapel. Susan Rodenberg teaches middle and upper school English and History. She graduated from James Madison University with a degree in English and with minors in political science and music. She is currently working towards a Masters of Education in Curriculum and Instruction at Regent University. Susan is a state licensed teacher who has been teaching middle school English for the last few years at Berkeley Middle School. Her daughter, Emma, is a WCA alumnus and her son, Peter, is a current student. Susan is a published author and is excited to enhance student appreciation of literature and improve their writing skills! 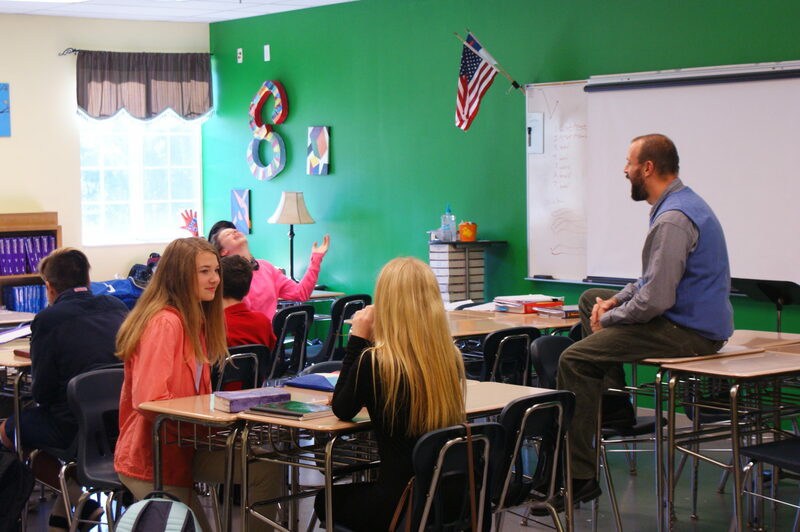 Dan Stec is a second-year faculty member at WCA, instructing Middle School English courses and Upper School Pre-AP English. Dan graduated from Concordia University in Mequon, Wisconsin with a degree in Education and English and has spent over 10 years as a Christian school teacher. Dan recently relocated with his wife to Williamsburg with their two young children. She is the worship leader at King of Glory Church where they are members. He is passionate about writing skills and developing those skills in our students. Susan Rodenberg teaches Middle School History at WCA. She graduated from James Madison University with a degree in English and with minors in political science and music. She is currently working towards a Masters of Education in Curriculum and Instruction at Regent University. Susan is a state licensed teacher who has been teaching middle school English for the last few years at Berkeley Middle School. Her daughter, Emma, is a WCA alumnus and her son, Peter, is a current student. Susan is also a published author. Dan Stec will be instructing our Middle School American History and Civics Courses. Dan graduated from Concordia University in Mequon, Wisconsin with a degree in Education and English and has spent over 10 years as a Christian school teacher. Dan recently relocated with his wife to Williamsburg with their two young children. She is the worship leader at King of Glory Church where they are members. Kristie Van Housen teaches Middle School Saxon Math, Earth Science, and monitors middle school Odyssey of the Mind, and is also the teacher sponsor for the Middle School Student Council. Kristie grew up in Williamsburg and received her B.S. in Communication Sciences and Disorders from James Madison University. This is her third year teaching at WCA. Some of her hobbies include going to the beach, cooking, and spending time with friends and family. She attends church services at Williamsburg Community Chapel. Kristie Van Housen teaches Earth Science, and monitors middle school Odyssey of the Mind, and is also the teacher sponsor for the Middle School Student Council. Kristie grew up in Williamsburg and received her B.S. in Communication Sciences and Disorders from James Madison University. This is her third year teaching at WCA. Some of her hobbies include going to the beach, cooking, and spending time with friends and family. She attends church services at Williamsburg Community Chapel. Scott Jones begins his second year teaching Physical Education at WCA. Scott grew up in Ohio and excelled in football, basketball, baseball, cross country, and track in high school. Jones graduated from Davis and Elkins College (WV) where he earned a BA in Physical Education while minoring in Health and Education. Scott also serves as WCA’s head girls’ varsity basketball coach. Last season in his first year, Jones led the Lady Eagles to a 17-5 record, was named Metro Coach of the Year, and his team reached the state semi-finals. In his spare time, Scott enjoys golfing, basketball, exercising and grilling out. He also has a passion for Ohio State athletics and is an avid fan of the Cleveland Cavaliers, Indians, and Browns. Scott attends Williamsburg Community Chapel.